I sent a draft of my dissertation to SL today. All 8 chapters, 210 pages and 47,859 words of it. All 49 figures and 43 tables of it. It was a 7.4 MB file. I still don’t have a conclusion and future research chapter, and I haven’t even begun to make the bibliography. Those alone will probably add at least another 50 pages. And of course I have no idea what in the world my committee is going to think of this draft. The final version could end up taking many more months and only resemble loosely (or not at all) what I sent SL today. The ultimate goal is to get this completed and defended before Fig arrives, which is now closing in on 5 months. That may sound like a lot of time to those not enmeshed in academia, but considering that it’s taken me more than a year and half to get this far, the next 5 months will go by pretty quickly. Plus, a defense after May (when the semester is over) is looking fairly unlikely. My department does allow summer defenses, but at least one of my committee members may have plans to be doing field research until mid-August, which puts us dangerously close to Fig’s estimated birthday. If I went into labor while defending my dissertation, perhaps my committee would become sympathetic, expedite their signing of the necessary forms to officially make me Dr. Ragfield, and then take me to the hospital. But in reality, I could never actually schedule my defense the same week as Fig’s due date… who knows when Fig will actually decide to make his/her entrance into the world. On the plus side, if I do have to postpone my defense until after Fig is born, I’ll at least be able to have a beer at the after-party. At any rate, we’ve made it to 16 weeks. Numerous women who have suffered horrifying morning sickness (including Dooce… yes, I read Dooce...) have reported that relief came at 16 weeks. I had assured myself that I’d feel better at 12 weeks (which came and went), and then 13, and then 14, and so on. In truth, I do feel better now than I did, but I am still not nearly back to normal. The smell of anything and everything is enough to bring me to my knees. And just the thought of any food other than whatever I am currently craving reinitiates the nausea (but Zofran still keeps me from throwing up). Food is definitely a challenge. It is difficult to be a vegetarian but have severe aversions to virtually all vegetables and most soy products. The biggest improvement I’ve had so far is that now I can stomach cereal and soymilk again, which helps immensely. That is something quick and reasonably healthy to eat when all else fails. I’ve also expanded the repertoire of fruits that I can eat: grapes and the occasional pear are now palatable. And as always, most things in cake or cookie form are generally welcome. My major current food of choice is still—you guessed it—avocados. My need for avocados has become ridiculous. 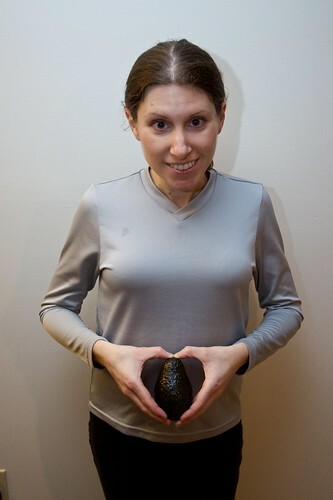 Many days I eat 2 whole avocados. I know that they are fairly healthy as far as food goes, but they are obscenely high in fat, especially when eaten in that quantity. And believe me, I would probably eat 10 per day if I would allow myself or could afford it. Sometimes I just eat them straight, and sometimes I mash them up and mix them with salt and lime juice. Lately I’ve been heating up frozen corn (an actual vegetable!) and then eating that with my avocado-mash. It is somewhat ironic, then, that this week Fig is supposedly the size of an avocado. According to the internet, Fig is around 4.5 inches from crown to rump—which is actually much larger than the avocados I usually eat. It will be very interesting to one day find out if Fig likes to eat avocados him or herself. Alright, a wave of nighttime nausea has just hit me, so it's time to listen to my hypnobirth CD and then go to sleep. Thanks for reading!